Auto Restart: Dehumidifiers automatically restart following a power outage. Superior Efficiency - Remove more moisture than many conventional residential dehumidifiers at the same or an even lower operating cost. Reliable Long Life - Solid internal construction and a heavy-duty cabinet contribute to years of reliable moisture control. 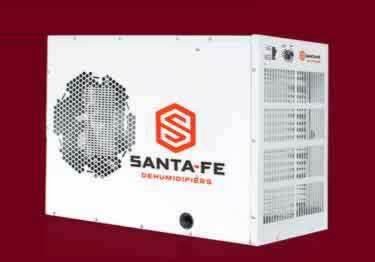 Energy Star-Qualified: Santa Fe dehumidifiers meet Energy Star standards for efficient operation and construction. Santa Fe Compact 70 Dehumidifier (4033600): Measuring just 12" x 12" x 21" the Compact70 is a space-saving, powerful crawl space dehumidifier that can extract up to 70 pints of moisture a day. The Compact70 can save valuable crawl space as it's small enough to suspend and fit in between floor joists by installing with the optional Hang Kit (sold separately). Rotating exhaust outlet provides for horizontal or vertical discharge. Additional features include auto defrost, 2-stage air filtration, simple controls and MERV-13 filter. Available accessories sold separately include: Condensate Pump (sold separately) allows for running the included 3/8" x 20'' drain hose horizontally across crawl floors or upward vertically (15'' run) and out through a window or doorway to outdoors. Energy efficient, it operates with a flow switch that directs the pump to run only when needed. Santa Fe Advance90 Dehumidifier (4034180): A smarter, more efficient and effective solution for damp, mold-prone crawl spaces. Features dual exhaust vents for improved airflow to help increase dehumidifying efficiency, keeping operating costs down. Specialized horizontal design allows it to fit in spaces where traditional dehumidifiers can''t. Measuring 14.5"W, 19.4"H, 26"L it features a compact low-profile housing made of rugged powder-coated steel and quieter operation. Extracts up to 90 pints of moisture a day. Additional features include low-temperature operation, humidity control knob, independent fan control and MERV-13 filter. Available accessories sold separately include: Condensate Pump allows for running the included 3/8" x 20'' drain hose horizontally across crawl floors or upward vertically (15'' run) and out through a window or doorway to outdoors. Energy efficient, it operates with a flow switch that directs the pump to run only when needed. Sentry Monitoring System allows for the remote monitoring of crawl space and basement relative humidity, temperature, and water emergencies via WiFi and the Sentry smartphone app. Includes Sentry monitor, water sensor w/50'' of cable, 6'' power cord, hanging fastener, and quick start guide. Small Hang Kit for residential use. Keeps unit off floor and out of the way. Includes: (4) ratchet straps, (2) support brackets and hardware. Duct Kit (Supply Only) used to duct the 2 outlet vents of the Santa Fe Advance 90 dehumidifier. Includes (2) 10" supply duct collars, fasteners, and optional duct cover plate (for single duct install). Duct Kit (Return Only) includes 1 return duct ring insert and 1 front panel assembly to hold the ring in place. Flex Ducts add flexibility to dehumidifier installation. Achieves greater moisture control by directing the supply of dehumidified air within the crawlspace or basement. Size: 10" x 25'. Pleated Filters. Select from MERV-8, MERV-11 or MERV-13 to filter out both large and microscopic allergens such as dust mites, mold spores, pet dander and more. Duct Kit (Supply and Return) quickly adapts 8" flex duct to allow for collection and targeted distribution of crawlspace and/or basement air. Includes fasteners and 8" supply collar w/assembly. Flex Ducts add flexibility to dehumidifier installation. Achieves greater moisture control by directing the supply of dehumidified air within the crawlspace or basement. Size: 8" x 25'. Controlling crawl space humidity is a critical, important step in providing home safety, a healthy indoor environment, and overall household comfort. Santa Fe Dehumidifiers are designed to provide just that while also helping to eliminate mold, mildew and rot. Fix your Crawl Space storm water drainage problems with less labor cost using our Gravel Free French Drainage System.